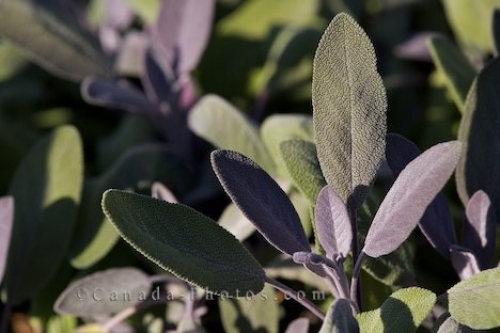 A herb which has beautiful purple coloring on the leaves of the sage plant which flourishes in the Montreal Botanical Garden in Quebec, Canada. The sage plant is a small evergreen subshrub which displays its purple gray coloring of leaves throughout the year but only flowers during the summer months. This herb is used in a variety of cooking recipes as well as different remedies in the medical world. The sage plants at the Garden of Innovations at the Montreal Botanical Gardens thrive as they are well taken care and are grown in the proper type of soil in which these herbs adore. Sage - Purpurascens, Salvia officinalis, Garden of Innovations at the Montreal Botanical Garden, Jardin Botanique de Montreal, Hochelaga-Maisonneuve, Montreal, Quebec, Canada. Picture of a herb known as a sage plant, thriving in the Garden of Innovations at the Montreal Botanical Garden in Quebec.